Nearly all reviewers recommend these Adidas basketball shoes. According to many, these are phenomenal basketball shoes like the Vol 3 Hardens and the Dame 5. Several commenters just love the D Rose 9’s beautiful design. They are saying that it has a nice casual look. More than a handful of players appreciate the Bounce cushioning. They claim that it is just as good as Boost. This shoe’s quality is top-notch, a good number of owners declare. The materials feel nice on-foot; they are comfortable and durable. According to a few users, the traction is good to go right out of the box. Some testers are satisfied with the level of support and lockdown that the shoe provides. They claim that there is zero heel slippage and side-to-side movement. Several reviewers are pointing out that these basketball shoes are a half size too big. They say that the there is a lot of dead space and the overall fit is just bad. One tester is disappointed with the traction. He claims that he keeps on sliding when playing on indoor courts. A few reviewers are reporting that the Adidas D Rose 9 has horrible ventilation. Reviewers are a bit at odds with how the Adidas D Rose 9 performs on the court. The traction is a point of contention as well as the shoe’s fit. Everything else - materials, support, lockdown, and cushioning - works as expected. All things considered, the D Rose 9 is a decent on-court performance basketball shoe. If you are a D Rose fan and have $140 to spare, then go ahead and try out these Adidas basketball shoes. The traction isn't there. The fit isn't there either. A lot of the important parts and aspects of the shoe aren't very very good. This traction was great straight out of the box. Despite all the setbacks, Derrick Rose continues to put in work and is determined to come back stronger. The Three Stripes is helping him get back on track in the 2018 Offseason with the launch of his latest signature sneaker, the Adidas D Rose 9. Built for summer runs, the D Rose 9 combines Primeknit and Adiwear to create the most comfortable basketball shoe Adidas has to offer. These Derrick Rose shoes feature a sock-like construction and responsive cushioning to help you attack the paint and accelerate past the defense even in the scorching summer heat. Cushion. The Adidas D Rose 9 features full-length Bounce for cushioned comfort. The Bounce cushioning enhances comfort, flexibility, and responsiveness. Traction. These Adidas basketball shoes are equipped with Adiwear for superior grip. Adiwear is designed to provide added durability and traction whether playing on the hardwood or the blacktop. Length and Width. Reviewers are reporting that these D Rose basketball shoes are a bit bigger than usual. They suggest going down half a size when ordering online. However, it is still better to try these shoes in-store to get a better fit. Lockdown. The D Rose 9 offers a secure, snug, and comfortable fit with its sock-like construction and neoprene collar. The lightweight upper provides increased stability when performing quick cuts, pivots, and side-to-side movements. These D Rose shoes are also equipped with an Adiwear midsole and a unique heel counter for functional support. The Adidas D Rose 9 features a Primeknit upper and Adiwear midsole for lightweight support. The sock-like upper helps wick away moisture for all-day comfort. The D Rose 9 has an eye-catching aesthetic that features horizontal black lines across the forefoot, tongue, and heel. The D Rose logo is present on the heel while a vertical Three Stripes branding is visible on the collar region. 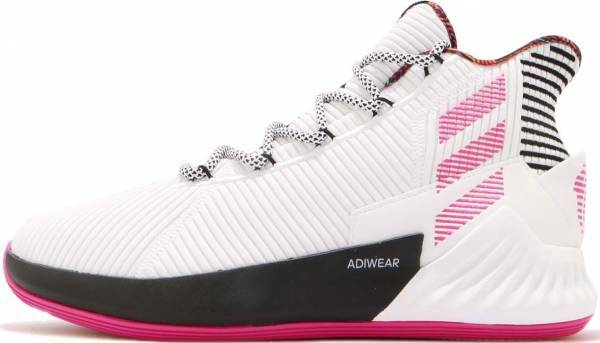 Launched in July 2018, the debut colorway of the Adidas D Rose 9 features a tricolored palette - cloud white, shock pink, and core black - finished off with a multicolored outsole and inner lining. Adidas releases more colorways soon including black/red, white/grey, grey/gold, and black/gold so make sure to return to our site for an updated list.